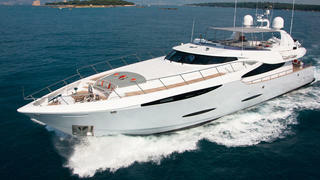 The 32.8 metre motor yacht Gems, listed for sale by the World of Yachting, has had a price reduction of €1,100,000. Designed by naval architect Bill Dixon, Gems was built in GRP by Turkish yard Leight-Notika to Bureau Veritas class and delivered in 2005. MCA compliant, she accommodates up to nine guests in four cabins consisting of a full-beam master suite, VIP suite, double and a twin plus a Pullman berth, all with entertainment centres, television screens and en-suite bathroom facilities. In addition, there are quarters for five crew aboard this yacht for sale. An open-plan saloon has comfortable settees in grey fabrics in the lounge area to port with a bar to starboard and an entertainment centre including an LG television screen and a Bose stereo surround sound system, while forward is a formal dining area seating eight guests. The aft deck area comes with U-shaped built-in upholstered seating, a table and three armchairs, making it the ideal location for al fresco entertaining and dining. Up on the flybridge, more outdoor relaxation is offered with seating for 12 guests, a bar, barbecue grill, Jacuzzi and a partial hard top. Twin 2,000hp MTU engines give her a cruising speed of 23 knots and a range of 1,850 nautical miles at 12 knots. Lying in the South of France, Gems is now asking €1,900,000.